Classical frontside illuminated CMOS and CCD image sensors are suitable for visible light imaging, yet suffer serious degradation in spectral response for wavelengths especially in the near and deep UV. 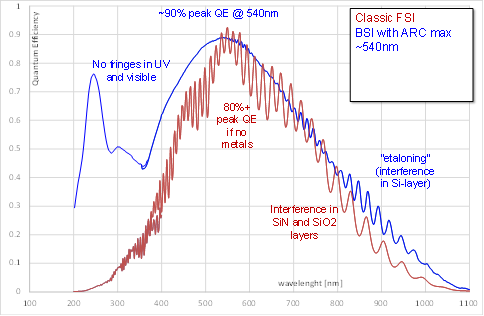 The underlying reasons (interference, material-specific absorption, coatings, surface treatments) are fairly well understood, and certain measures to enhance the UV response are possible. Backside illumination with 3 combinations of Si layer thickness and anti-reflective coatings.